I finished this book about two weeks ago and I'm still in a hazy book hangover because it was so perfect. I wish that could be my whole review of it- but I'll try my best to do a better job describing it. Also, this author only has two books- but both of those books have earned a place on my favorites list. Here's to hoping his beautiful words happen again in a third book some day. 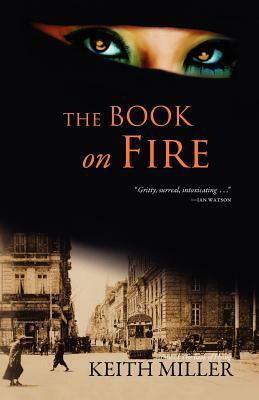 The premise of The Book on Fire is that a book thief arrives in Alexandria and meets a girl mysterious girl who immediately guesses what his favorite book is and asks for him to give it to her. She immediately begins ripping pages out and setting them on fire. He later becomes obsessed with finding a way into the Library of Alexandria which has been closed to the public for thousands of years and is fiercely protected by its librarians. The book burner helps him find a way in. Our thief makes his way in and meets and falls in love with a librarian there who is actually half book herself. This is one of those books that is less about the plot and more about the beautiful poetic quality of his prose. This is a book about book lovers. This is a book for book lovers. This is a book for someone who can curl up in the same spot for hours and completely lose their surroundings to the story they are occupying. This book so accurately captures the feeling of being entranced and obsessed with stories. It describes how stories are completely different when they are read alone than when they are read aloud and shared with another. It wonders what happens to a story when its book has been burned. Keith Miller if you happen to see this review- please write another book. I'm hooked. I'm totally sucked in just by the title and I adore books about books. Books about libraries are even better. I will look for this for sure!